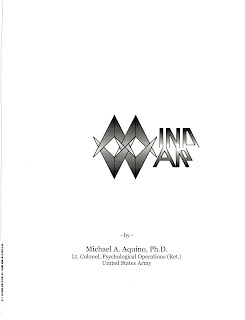 Front Title Page of MINDWAR - the expanded 1980 book by Michael Aquino and General Vallely re-released by Michael Aquino as a full 204 page book in 2013. 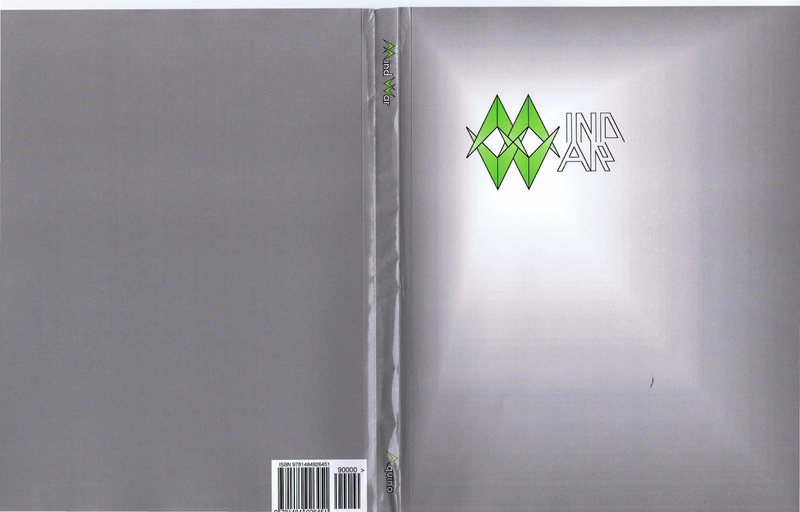 The front, side and back cover of MINDWAR. 2013 Copyrighting by Michael A. Aquino. 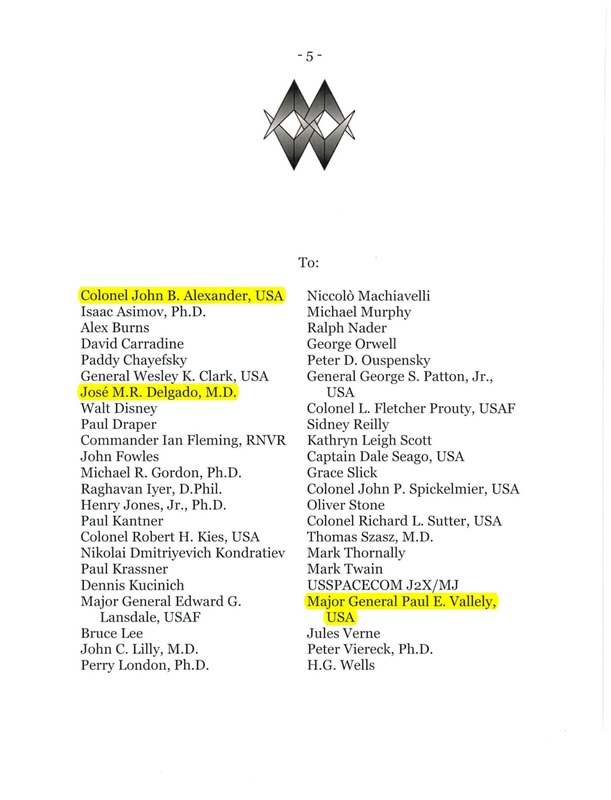 The dedication page of MindWar I have highlighted General Vallely as well as a couple of other interesting names. There are several New Agers on this list as well including John C. Lilly and Dennis Kucinich. I have sat on this Part 3 for some time and have also not submitted other items occupying my research time. Frankly, I was disappointed at the unusual disclaimer on my factually based article that the opinions expressed were solely my own. I had other health issues and frankly much was delayed although I have been intensely going through my library in cataloging and indexing operations. Today, I understand that Women Defending America will be having another event in my town and another one of the three Generals mentioned to me as instrumental in the founding of that organization will be speaking. If my information is correct, it is General Boykin. 1. He was the one who discovered Michael Aquino’s Satanism and exposed same. 2. He (General Vallely) cross-examined Michael Aquino at military hearings held on the matter. 3. He (General Vallely) as a “devout Catholic” never had nor never would have any intentional involvement with Satanism. Interestingly enough, per the local communications director of that organization, General Vallely was aware of the 1986 article I wrote in my then NEW AGE MONITOR and had been aware of it since its release then. That means that Michael Aquino was aware of it as well. Perhaps that issuance was what inspired the obvious CYA (roughly translated: “cover your posterior”) 1987 article by Michael Aquino demanding honesty and integrity in all military PsyOps. If you would like a copy of my June 1986, Vol. I, No. 2 New Age Monitor sent to your email box, simply email me at cumbey@gmail.com. Please put “Aquino-Vallely” in your subject line so I can ferret out those requests and promptly respond. As I received thousands of monthly emails, it is important that you label it such so I can do responsive searches and sends to your email address. Well, from Amazon I learned that the Aquino/Vallely document is today a 204 plus page one. Only Michael Aquino’s name remains on the “author/author” references. But, General Vallely does appear in that book. It appears as one of the prominent names on the dedication (“TO”) page. 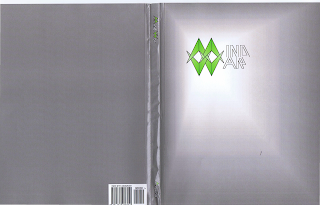 Photographic copies of the book cover and relevant pages are attached here for your viewing. Why the gratitude to Major General Paul E. Vallely? To me, the answer is obvious. The information I was given by a reliable informant in 1986 was that Aquino was actively promoting his Satanism in the United States Military and General Paul E. Vallely was his patron/protector. That obviously appeared to be still true in 2013 when Michael Aquino again released their book. Part IV, coming very soon: The methods to destroy faith (aka “taboos”) specified in MINDWAR.